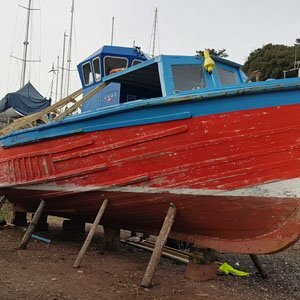 Devon Wooden Boats Ltd’s Privacy Statement for Customers - Devon Wooden Boats Ltd.
You may be aware through the media that a new law is now effective relating to your privacy, particularly the way in which your personal information is stored and processed by organisations. The new law is known as the GDPR. The General Data Protection Regulation is a new, European-wide law that replaces the Data Protection Act 1998 in the UK. It places greater obligations on how organisations handle personal data. It came into effect on 25 May 2018. It increases individual’s rights in relation to the personal information held by organisations, and for how long it is held; and insists on the legal basis on which personal data is collected, stored and used. What information does the GDPR apply to? The GDPR applies to ‘personal data’, which means any information relating to an identifiable person who can be directly or indirectly identified in particular by reference to an identifier. What information does DWB hold? 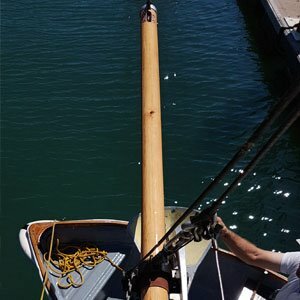 Devon Wooden Boats is a private, independent, limited company based in the UK. We collect your personal information in order to administer our business. This information is held in a secure manner electronically in our accounts software, e-mail system, telephone systems, and on paper. It is not shared with any other third parties except where we are legally obliged to do so. The personal information we hold includes your name and contact details such as physical address, e-mail address, and telephone numbers. Additionally, CCTV operates within the building and recordings are held for a period of 28 days. The information we hold is of course necessary for us to administer our business with you and provide the products and services you have requested., and this necessity is our legal justification under the legislation for holding your personal data. We will not use your data for any other purpose. We will inform you of any changes to the way your data is held or processed. What rights do individuals have? You have the right to request a copy of the information that we hold about you, and to correct it if necessary. You have the right to be advised should a breach in our security measures affect any of your personal information. Site designed by Devon Wooden Boats Ltd. ©2018 | Theme: Sydney by aThemes. 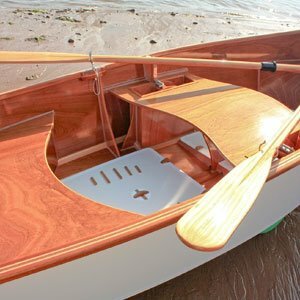 Customised by Devon Wooden Boats Ltd.
Our traditional shipwrights have experience ranging from restoring rowing skiffs and performance racing dinghies up to classic superyachts and everything in between. The company specialises in private and commercial wooden vessels up to 50ft (15m) with a maximum allowance of 65 passengers and 2 crew. Our yard rate for Shipwright Services is £29 per hour. Free storage whilst work is underway if carried out at our premises. All prices are ex vat. We cover the areas of Dartmouth, Kingswear, River Dart, Torquay, Totnes, Teignmouth, Shaldon and Starcross in Devon from our workshops at Ipplepen. We undertake all marine electrical refits from dinghies with a couple of navigation lights right up to large pleasure craft with multiple complex systems on board. We are members of both the British Marine Federation and the British Marine Electrical & Electronics Association and qualified BMET and NMEA MEI installers, giving you confidence that you are dealing with competent professionals who take their work seriously. We aim to meet any budget so long as safety always comes first! We like to use our refit work as a showcase demonstrating how proud we are of our work. All cabling will be a work of art, electrically speaking. You will not find loose or untidy cabling anywhere on our refits with all cabling laid out in a very logical manner. Something we pride ourselves on as a company is our ability to hide otherwise visible cabling without compromising serviceability. All refit work, as with all our work, will be provided with fully marked cables along with a legend and any instructions. Here at Devon Wooden Boats, we have our own range of exquisite wooden and workhorse GRP dinghies. The Devon Darlin’ 11’ was designed and built to set the bench mark for the standard of workmanship of the company. 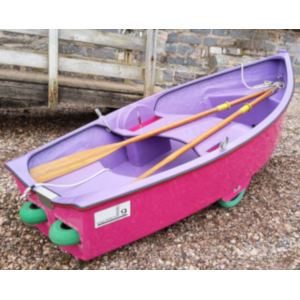 The Devon Darlin’ 11’ is a wooden amphibious rowing dinghy that really turns heads whether stationary in the club dinghy park or on the slipway/beach. Just step out and keep walking with the boat at your side - no more wondering who has used your launching trolley or where have they left it this time! The easyLAUNCH 9 Dinghy is a GRP development of the Darlin’ 11 as people asked for a utility version. This easyLAUNCH 9 Dinghy being the first of a range is intended to be an easy to store, easy to launch and easy to drag back up the beach or slipway everyday use tender. With its built-in retractable launching wheels positioned at the balance point of the dinghy it makes for very light work to manoeuvre over most surfaces including gravel and sand with the 14-inch diameter solid puncture proof launching wheels. As we all know, the marine environment can be a harsh place at times, especially where electricity is concerned. This can lead to a number of faults occurring on vessels from simply annoying to incredibly dangerous. 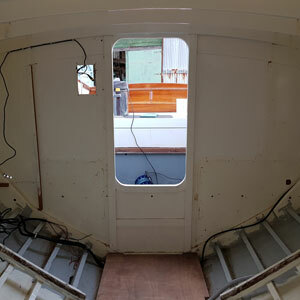 There are also little to no regulations on marine craft when it comes to electrical installation. 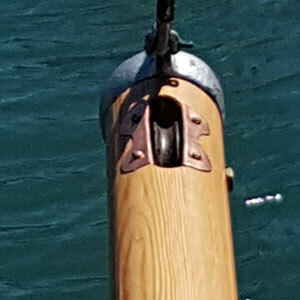 This can leave vessels, which may have changed hands many times over the years, with potential electrical hazards requiring fault finding and rectification. 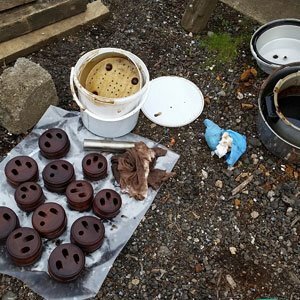 We provide a full fault finding service to track down these gremlins and offer advice on further action required. From a flickering cabin light down to those batteries that just won't perform as expected, we aim to track down the problem quickly and efficiently and prioritise any problems found. 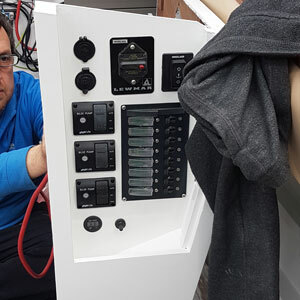 We will also advise if your installation conforms to the BMEEA Code of Practice including the ISO marine electrical standards and the Recreational Craft Directive. 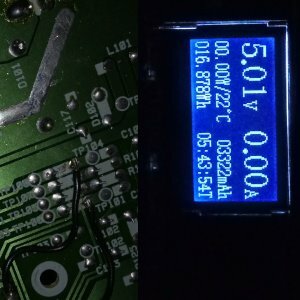 In our experience, many of these issues can be solved by bringing your installation in-line with these standards. Many electrical problems on boats simply come from poor design, planning and implementation. Splicing a new instrument into existing cabling may be a quick fix but are you introducing issues? When we introduce new equipment, we do a thourough job of examining existing cabling and layout and designing any alterations or new additions so as to complement, not detrement your vessel. We will ensure that we do not push the capacity limit of you existing infrastructure or introduce uneccesary junctions in otherwise unbroken cabling. We always design with servicing in mind, something many neglect, which will lower the overall cost of ownership by cutting down on future labour costs caused by poor access and allow parts of a system to be removed or replaced without cutting wires. Everything we do conforms to the BMEEA Code of Practice including the ISO standards for marine craft and the Recreational Craft Directive. All electronics introduced are installed to these standards and also the NMEA 0400 standard. We like doing the minor electrical jobs. 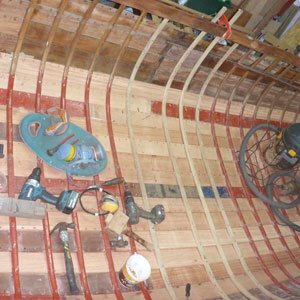 Many others say 'No job too small' but here at Devon Wooden Boats we really do mean it! 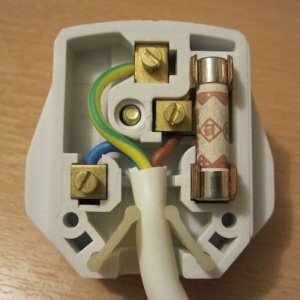 These are the jobs as small as replacing a switch, fuse or awkward bulb. The jobs that take less than an hour. We can often give on the spot advice too. All our smaller jobs are not rushed either. All our work will be carried out to the BMEEA Code of Practice, tested and documented giving you piece of mind that these little jobs have been done properly. 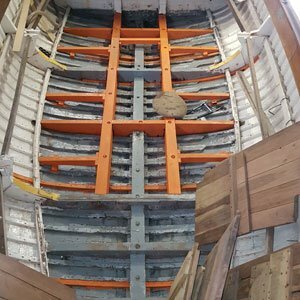 Taking on a major restoration can be a daunting prospect but it can be hugely rewarding to help preserve our maritime heritage or save a family heirloom for future generations. During our restorations we work closely with our customers throughout the process and are well known for our obsessive attention to detail and maintaining authenticity. We search out age appropriate fittings where required while hiding modern technology, so it’s only on view when in use. 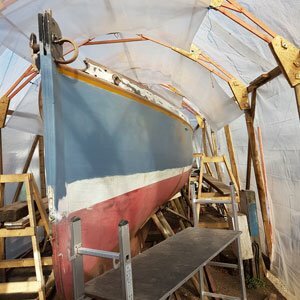 Our team currently has a combined 116 years’ experience in restoration on everything from clinker dinghies up to 92ft classic wooden super yachts. Every boat develops minor problems such as breakages or leaks from time to time. We are here to help keep your boat usable for the season by tackling even the minor jobs. We will also investigate a little further as sometimes a minor problem is a symptom of something bigger which could affect your safety, or end up costing a lot if not tackled soon. 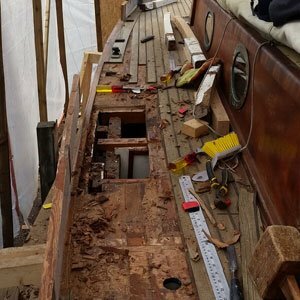 Often, we can do a quick repair which can temporarily stop the damage progressing to keep you going for the season and then schedule the main work as part of our annual refit services. Ancillary Items – Spars, Deadeyes, Blocks, Cleats, Steps Etc. We make traditional deadeyes from Elm and treat them in the traditional way. 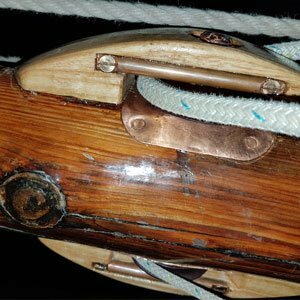 They are handmade with the grain running in the correct direction and match existing ones to a specific design for your boat. 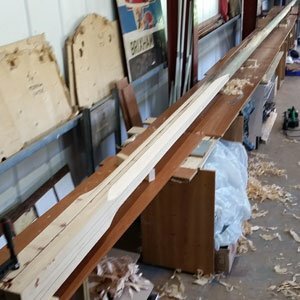 We also make everything from cleats, ash blocks, companionway steps, bowsprits to full spars including regluing and repairing. We even make new teak decking for fibreglass boats. If it’s wood and goes on a boat, we can make it. We refit private dinghies, launches and yachts up to 50 foot (15m). 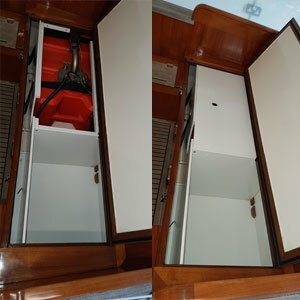 Refits range from minor jobs like finding and fixing leaks to replacing planks and re-caulking and any other jobs required to keep the boat looking great and in top condition. We are insured to refit commercial wooden vessels up to 50 feet (15m) with a maximum of 65 passengers and 2 crew. We work with the MCA surveyors and are always present to assist the owner/operators when the MCA visit to ensure all requested works are carried out. We help plan and agree with the MCA future maintenance schedules to maintain the coding of the vessel. We also assist the owner/operators while working with surveyors to help get vessels ready for being newly coded for charter or commercial passenger carrying.